Highest performing Honda and Briggs & Stratton engines for the toughest professional cleaning jobs: surface preparation, chemical treatment, horizontal cleaning, etc. QuikDisconnect tips and chemical injector kit, very easy to exchange, covering widest range of applications. 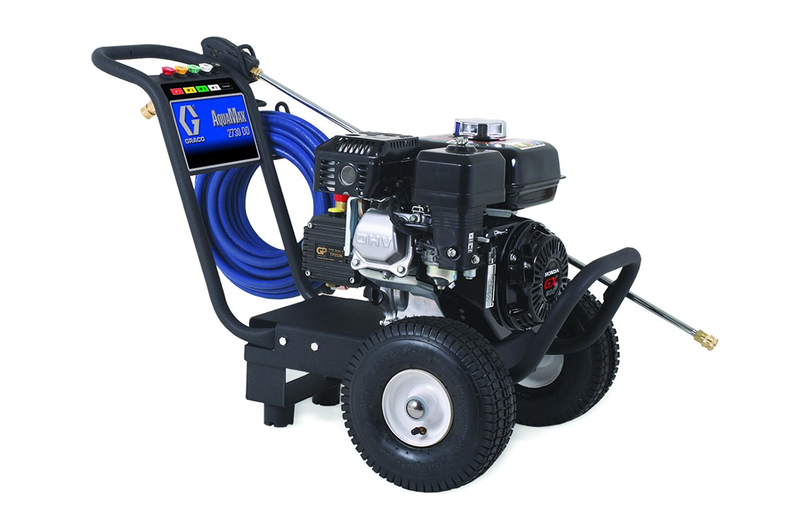 Tubed pneumatic tires, gun and hose holder for easy transport and storage. Maximize your cleaning power by selecting the tip that best matches the maximum pressure and flow of your pressure washer from the chart at the right. The QuikDisconnect features make it very easy to exchange tips. 15 meter hose x 3/8" with quick connections, swivel and bend restrictors. Professional-grade insulated trigger gun comes with insulated lance (dual on hot gas). Roll easily over rough terrain and withstand the harsh jobsite environment. Triplex piston and ceramic plungers with continuously lubricated packings, for ultimate performance. Protects the pump from overheating and prevents excessive packing wear.